The inaugural Manchester Remembrance Ride for Traffic Victims was held on Saturday 15 November 2014 to coincide with the UN-sponsored World Day of Remembrance for Traffic Victims, which falls on the third Sunday of November every year, as well as other events around the UK aimed at raising awareness of road safety, most notably London’s National Funeral for the Unknown Victim of Traffic Violence and Birmingham’s Ride For Hope. 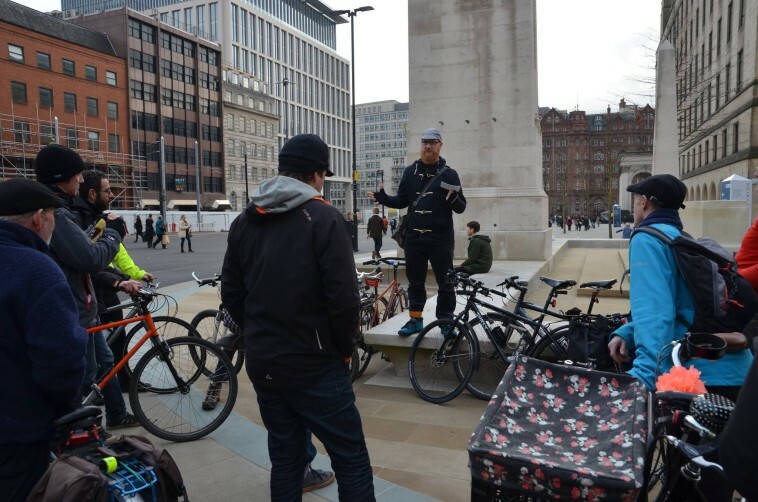 The format we chose for the Manchester event was a bike ride from Platt Fields Bike Hub visiting two ghost bikes, with the opportunity for others to join us at those points at set times, and ending at the cenotaph on St. Peter’s Square. 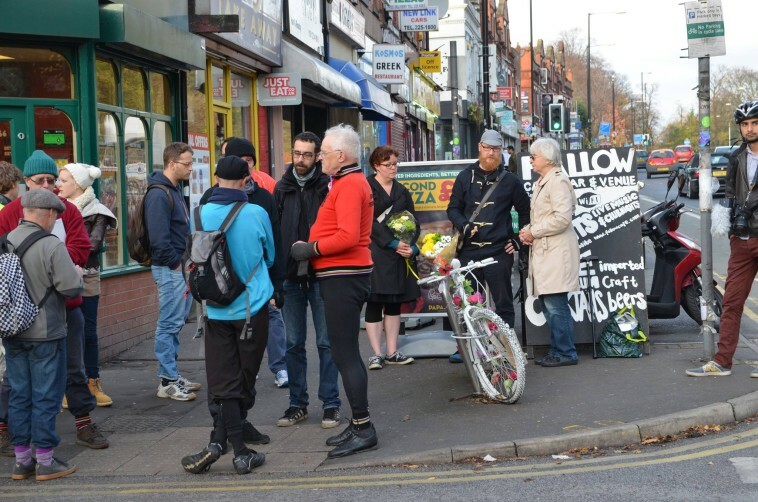 The ride was arranged at fairly short notice and publicised largely via social media, and it was heartening to see that some 20 people took time out of their weekend to come and pay their respects. We rode the short distance to Josh Jarvis’s ghost bike at Landcross Road, where we were met by a local resident who had been involved in having the ghost bike erected. She described the shock felt by the local community at Josh’s death, her dismay at the still-dangerous conditions on the stretch of road where Josh died and explained how the ghost bike had come about: one resident donated a bike, another sprayed it white and the community tends it in Josh’s memory. Josh was a 21-year-old student at Manchester University reading film studies and looking to make his career in the media. He died on 11 February 2014 following a collision with a cement mixer and, as far as we could ascertain, there have been no legal proceedings in the matter to date. We attached some flowers to the bike and observed a minute’s silence. From there we rode the two miles or so to the site of Jaye Bloomfield’s ghost bike near Hulme Street, attached to the railings of the central island of a crossing over a slip-road to the A57(M). Sadly the bike was damaged by another speeding driver in September of this year, so we were initially unsure of whether there would be a bike to visit. However, the bike has been re-attached, its bent wheel and twisted frame rendering its symbolism all the more poignant. Within a couple of moments of arriving at Jaye’s bike, two contrasting incidents underlined the importance of engaging in such an act of remembrance. First a driver noticed us gathering with our bikes, slowed and said that he drives past the bike almost every day and each time he sees it it touches his soul that a person died there. His words had barely faded when the driver of a souped-up hatchback, noticing nothing in particular, wove through the traffic at considerable speed, engaging in exactly the behaviour that cost Jaye her life at that very spot. The sense of shock within our group was palpable and a number of unpublishable utterances were hurled in the direction of the reckless driver. We then gathered to pay our respects to Jaye. She was 44 years old and in the process of setting up her own web-design business. She was about to celebrate the first anniversary of her civil partnership with Gemma, whom a number of the group had come to know since the tragedy. She was killed by a speeding driver as she wheeled her bike across the crossing on 3 August 2013. The driver was arrested for causing death by dangerous driving but charges were later dropped as the signage was allegedly unclear. The Critical Mass following Jaye’s death was dedicated to her memory, and Kieran Evans, who is instrumental in running the Manchester Critical Mass, said a few words about that event: that everyone was urged to wear red (Jaye’s favourite colour); that “funeral masses” (Critical Masses in memory of one of our clan who has fallen) are very difficult, emotional events; that he didn’t know Jaye, but that she must have been an amazing person, having since met some of her friends and listened to their memories of her. 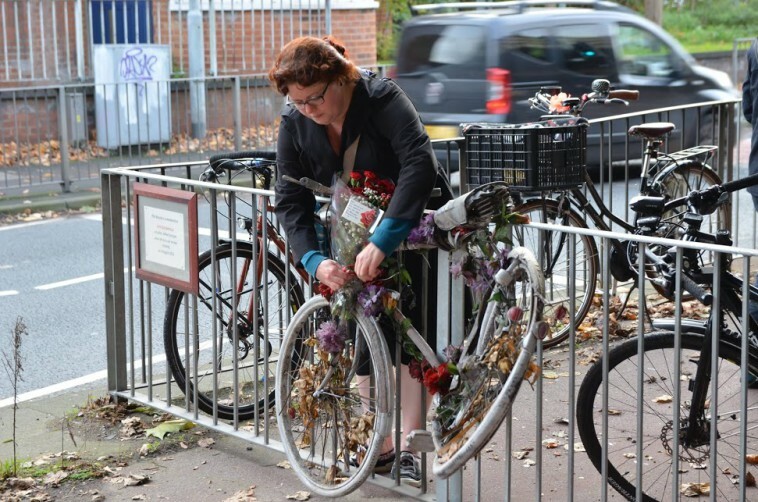 We attached some red flowers to her bike and observed a minute’s silence in her memory. The aim of the ride was to pay our respects to the victims and reflect on the causes of traffic violence. Although it was a bike ride, we were there to remember all traffic victims: drivers, passengers, pedestrians, cyclists, horse riders and many more. Around the world there are some 1.2 million road deaths each year. Some 30,000 people die on the USA’s roads annually – the equivalent of three jumbo jets crashing each week. In any other area of life such loss and suffering would be unthinkable, but roads are treated differently. In the UK road deaths have halved since 2000: in 2013 1,700 people died on our roads. But that’s still too many. There are also many indirect fatalities from pollution and the effects of inactivity, in which car-dependence plays a part. To quote Chris Boardman: “The way we travel now is killing us”. Yet there are things we can do to improve matters: improved HGV design and driver training; creation of places to cycle and walk safely; reduction of speed limits; enforcement against drink and distracted driving; “Vision Zero” initiatives such as that in Sweden, aiming to eradicate road deaths; ensuring that drivers are properly punished under the umbrella of “road justice”, to name just a few. So, although the ride was not affiliated to any particular cause, all were urged to continue applying pressure in their preferred manner and keep working to make our roads safer. We then held a moment’s silence to remember all victims of traffic violence. It is intended that the Remembrance Ride becomes an annual event and will be in the cycling calendar again next year.